Hi Terri. I love your Hammersley beauty. I love the rounded square cups like that. 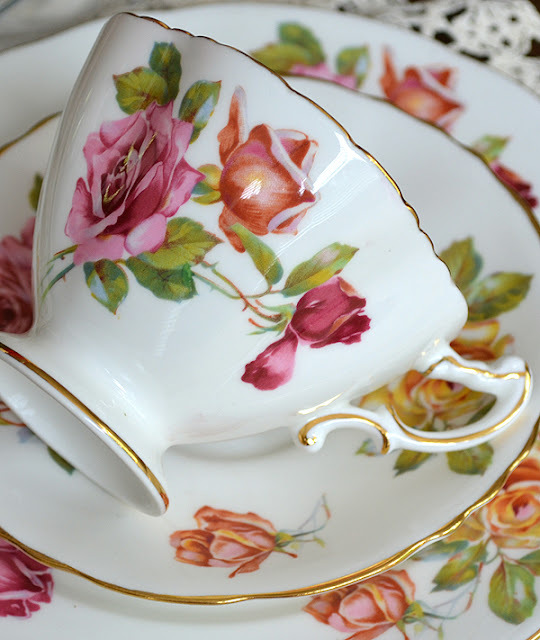 I am back from a restorative holiday and have a new URL for my blog & Tuesday Cuppa Tea....www.antiquesandteacups.info. 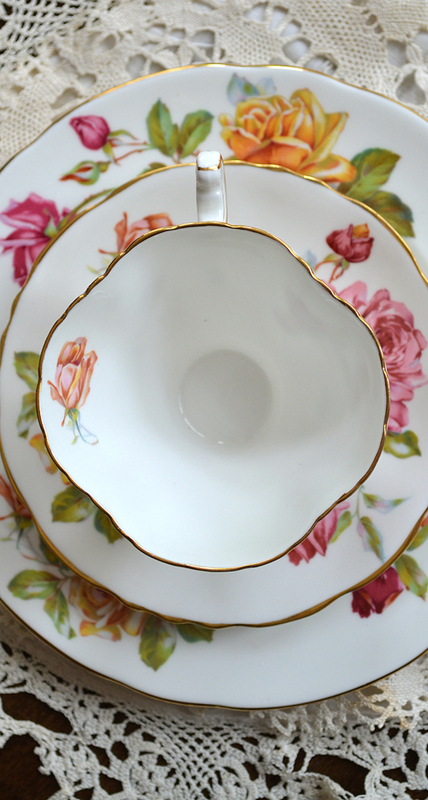 Your teacup is wondefully special - I too love the shape of the handle, and the flowers. Wow - a lot of work on those chairs. I just love your trio that you featured today. It really is nice to know the name of every teacup. Thank you so much for hosting this lovely tea party. It is such fun! 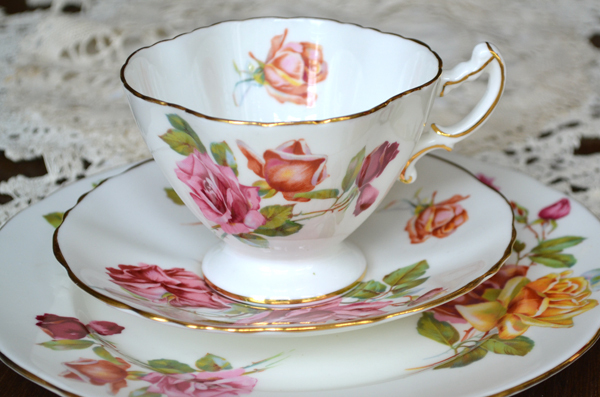 Oh, I love very much this teacup, it's marvellous with the sweet roses on it, and I like its name! 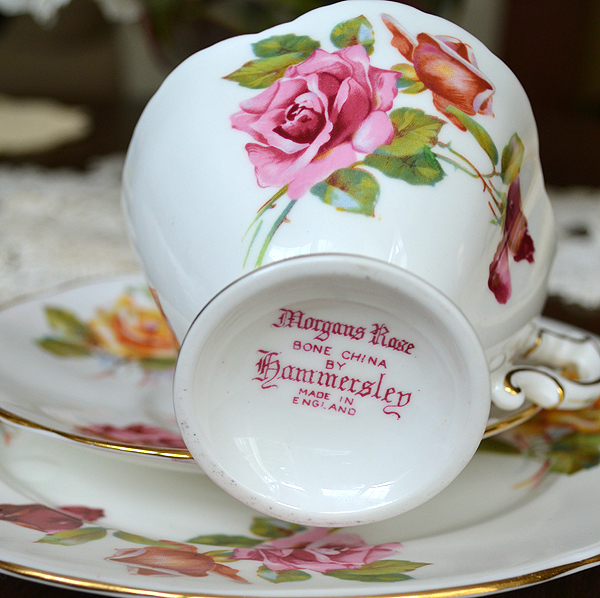 the Hammersley tea cup is really amazing. Lovely shape and beautiful decoration. I think all elves would eb happy to have such sweet shaped ears. I am so curious for the upcoming event. Will be a big party. The first additions look really good. Thank you for sharing and thanks for hosting this sweet event. What a gorgeous trio set of roses! Are the roses on the table the ones that have just bloomed? You must be totally overjoyed having waited so long for this! Love the idea of the garden party. I would so love to take part but am putting my energies into my dear friend, Andrea's health issue. What a lucky girl you are to have received all those little treasures from dear Dorthe. Her angels are just exquisite. 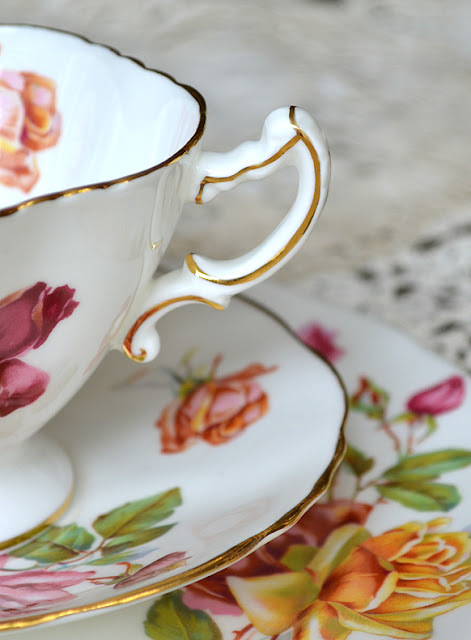 What a gorgeous teacup, I love the shape of it and the name. Now I'll be looking for one since my granddaughters name is Morgan. Wouldn't that be a nice gift for her. You know I love the tea trio, and your no exception: it's beautiful. What a pretty trio! I love the roses and the name on the bottom. You have found some nice items for your garden tea. I am not sure if I can do a garden tea or not. It really depends on how my back is at the time. Thanks for sharing and have a lovely day. I'm excited to see how your Garden for tea turns out! 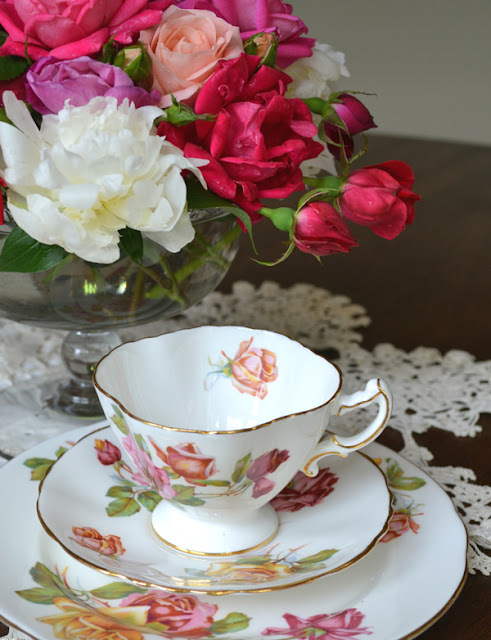 What a lovely teacup and saucer and plate and your bouquet is wonderful! Hi Terry! Time goes so quickly. Another Tuesday rolling by! I love your display of roses in a bowl alongside that beautiful rose tea cup and plate. I like that handle, rather original! Your chairs are lovely! You were so lucky to find them. I can't wait for the reveal. It will be such fun! A gorgeous cup, Terri. And the roses on the table match the roses on the cup...so very delightful to relax with. Your chairs are going to be wonderful. Love their curves and designs. Love the chair on the table. The slender and the curve of feet are elegant. I am sure your tea garden party will be a success. That really is a piece of art, so beautiful! Your purchases are so lovely, Terri. They have great "bones" and I can't wait to see the final results! Isn't ASCP a dream to work with? I have kitchen cupboards in our guest house that will be a project this summer...going to paint them with French Linen. Hello Terri! Glad your roses and peonies are blooming and you can enjoy their frangrance. Your Hammersley cup and saucer with the dessert plate is gorgeous. I love all the beutiful rose designs and when the name of the pattern is included. The idea of a tea spot in your garden sounds lovely. I love our patio with the table and chairs plus the setting area. It is wonderful to have a time to have tea, treats and watch the dogs playing. Each of your chairs have a beautiful design and it is wonderful you are sharing the process. I look forward to the next update. Thanks for hosting! Your rose busches must be so beautiful.. the ones you show here looks gorgeous and I love that deep red colour. And what lucky finds for your garden tea party, I love both chairs- and yes I would say, a tiny blue-more pink, and ofcourse chinz , lol,lol- oh it will look divine Terri, and how I would love to take part, but have to wait till next year with such lovely happenings, when I have closed my shop for good!! Then no more turists around my home and shop (on same property) !! and then more time for other more sweet things to do ! Thankyou for your wonderful comment on my blog- dear friend- there will be a little answer one of the dayes !! 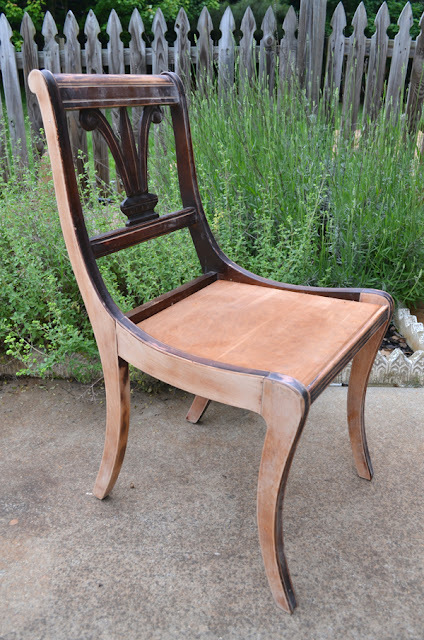 I SO love Renaissance Revival, and that is, I believe, what the beautiful chair is that you have for your daughter. The Annie Sloan chalk paints are marvelous. 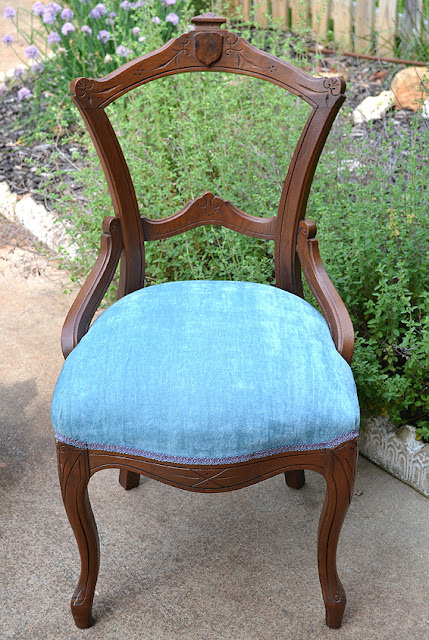 We use them here on many items for our purposes in selling prettily painted furniture. 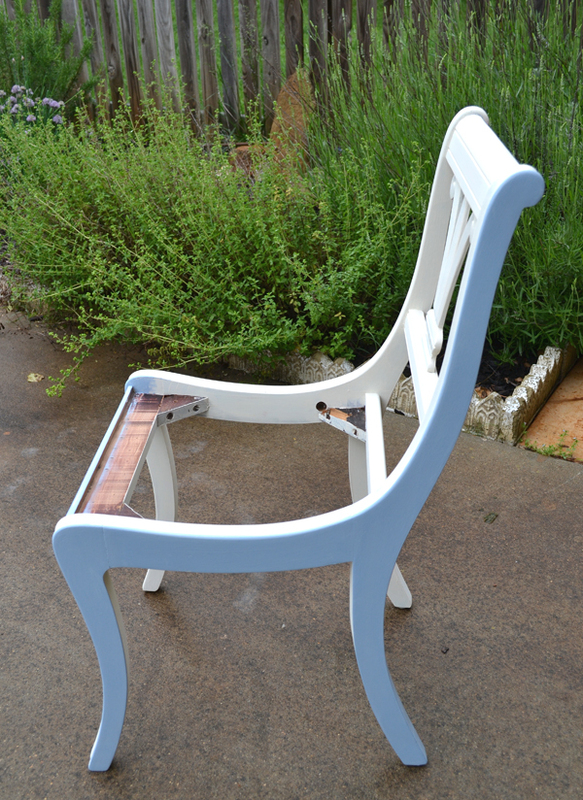 The chair you've painted in the Old White and Louis Blue is stunning! And of course, your teacup is beautiful too. quelle est belle cette tasse ces ensembles de 3 sont rares! I like the pattern of your trio set. The Royal Doulton store near us sells them and I've been so tempted to treat myself some day. I am looking forward to seeing your spot for tea in the garden. Guess I'm lucky my hubby built me a tea house which is just a roof over a wooden platform but it's mine to decorate and enjoy. Such a pretty teacup trio! How wonderful that you have roses and peonies blooming already! 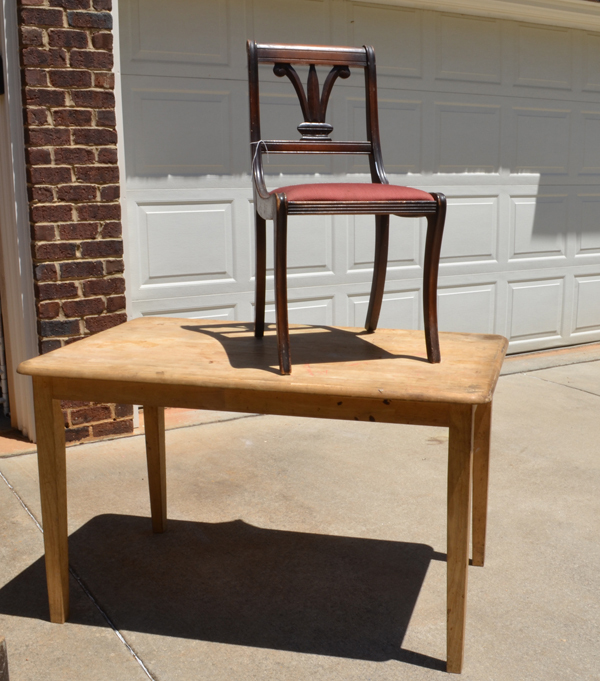 Your chair and table project is coming along nicely! Love the chair for your daughter, so pretty! Thank you for hosting and have a great week! The trio set is divine! And I love where your outdoor tea party is going! The mismatch is heavenly!! I love, love, love your teacup!!! It has the prettiest combination of colors in those roses. And your roses? Oh my, they are gorgeous. I am so glad you shared. I try every year to grow them but the deer eat them. I like the name on the bottom too. I wish they had always done that. Preciosa taza con flores hermosas y de muchos colores, matices intensos como las rosas de tu jardín. Me gustó mucho tu presentación del té. También las sillas y mesa que compraste para preparar ese encuentro que quieres organizar. Te felicito. I am just amazed at all the teacups you have and all the work you are doing for your garden party! It is going to be incredible, just by the pieces you are showing already and the paints, colors, etc! You are amazing! That is one gorgeous tea cup and saucer!